Do you ever feel like you just can’t fit enough time into your days to clean your home? If so, you aren’t alone. Cleaning your home is just one of many things that compete for your time, attention and energy each day. Sometimes, it can feel like just plain drudgery to do, and it generally can be put off, at least for a while. That makes it a prime candidate for being shoved to the bottom of your priority list. We, as a society, suffer from the cult of “busy.” I know I myself have fallen into the trap many times of thinking, “I don’t have time to clean that right now, I’ll do it later, because I’m busy.” I also look at certain huge messes or big projects in my home and think, “This is such a big task I’ll wait until I have all day to devote to it.” These feelings can be compounded when we are spouses and parents, and responsible for taking care of our homes, because there genuinely are lots of things to do with the kids, for your home, your spouse, and yourself, and cleaning does take time and energy. However, everyone has the same 24 hours in every day, and seven days in their week. As much as my mind sometimes seems to think “later” will be less hectic than now, it never turns out that way. Plus, I don’t think in my all my years as a parent I’ve ever had a day I could devote to a single task, without interruption. Heck, even if I did I know I sure wouldn’t want to spend that day cleaning stuff. So, what does a busy mom who wants a clean home do? You have two choices. The first is to clean your home irregularly, in a big marathon session, when a crisis comes up and it just has to be done. That crisis can be external, such as friends or relatives coming to visit, or internal, such as when you’ve had it with your messy home and just cannot take it one more second. Then, you disrupt your normal schedule, clean your home from top to bottom, exhaust yourself thoroughly, and vow not to clean again for a good long time because you are so sick of it. Sure, right afterwards you enjoy that nice clean home, but it quickly starts to get dirty again. Sound familiar? I know it does to me because I have done marathon cleaning sessions more times in my own home than I can count. The other option, and the one I strive towards (but still struggle with sometimes) is to clean my home as part of my normal schedule. Instead of disrupting my normal schedule to clean I’ve found that if cleaning is actually part of the schedule I get all the cleaning done more quickly. Plus, the icing on the cake is that most of the time my house actually stays relatively clean, so I can enjoy the fruits of my labor most of the time, not just for a day or two after the marathon cleaning session. 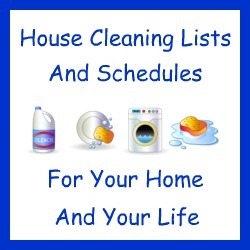 So, how can we all fit house cleaning into our schedules? There are several strategies you can use, but first I want to break cleaning tasks up into two big groups, because there are different approaches for each group. The first group are those tasks that need to be done daily, and never really seem to get “done.” You know, like cleaning up the kitchen from meals and snacks, or tidying up your home from play forts to homework projects. You may finish cleaning the kitchen and emptying the dishwasher, but the next time you walk in someone has eaten a snack, or it is time to prepare the next meal and the cycle starts again. Or, you tidy up the room, but life happens and things get pulled out again by the next time you walk back in there. The other large group of cleaning tasks in your home don’t need to be done everyday, but instead less frequently. For instance, you don’t need to vacuum your carpets daily, generally, but it needs to get done regularly to keep them looking clean most of the time. Other tasks like this include mopping floors, a thorough bathroom cleaning, changing sheets and towels, dusting, and taking the trash to the curb. There are even more things that should get done in your home even less frequently, like flipping mattresses, carpet shampooing, washing shower curtains, etc. Part 2: Implementing these chores into your schedule. 1. Develop daily cleaning routines to take care of the never ending chores, and things that must be cleaned daily. For instance, when you get up in the morning you might want to empty the dishwasher, so you can refill it bit by bit as the day goes on and people snack and eat meals. Similarly, a couple of times each day, such as after each meal, you and the family may do a ten minute clean up, to put play things and homework away, and otherwise just tidy up the house. This daily house cleaning schedule doesn’t have to take long, and actually shouldn’t. The tasks on it should take short periods of time where you get a quick little job done before it piles up and becomes a big job. This saves you time in the long run, and makes things more pleasant all day long. Just think of it as a little investment so dishes don’t pile up in the sink that have to be dealt with in a big cleaning session, or feeling like you are tripping on junk all day long in your home. 2. Take advantage of small blocks of time. That leads me to this tip, which is to get out of the mind set of thinking that cleaning needs to take all day, and be done without interruption. As parents we don’t generally get big blocks of time to focus on one thing, because we get interrupted a lot. When fitting cleaning into your life and schedule you should take advantage of little bits of time here and there. This tip is really geared towards the “never ending” chores, like seeing a spill and cleaning it up right then, or seeing a toy downstairs and carrying it upstairs while you’re headed that direction. These small blocks of time are not when you should start a major cleaning project, like defrosting your freezer, but instead to get little things that will take less than two minutes done when you see an opportunity. 3. Develop a weekly cleaning schedule. 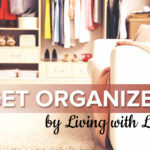 This tip is how I have tackled the second group of cleaning tasks, the ones that need to be done less frequently than daily, but still need to get done weekly. The key to fitting these types of tasks into your schedule is to devote a certain amount of time to them each week. However, I’ve found that your personality and other life circumstances really impact what type of weekly house cleaning schedule works best for you. There is no right or wrong way to get it done, so if one method doesn’t work for you try something else until something sticks, and then go with it. I will describe the two most common methods, on both ends of the spectrum, for weekly cleaning, and then you can choose one of them or a method blended between the two — whatever works for you! On one end of the spectrum you can choose one day of the week, and devote a couple of hours (or more) to doing all the weekly cleaning tasks for your home. Basically, you do a big session of vacuuming, sweeping, dusting, mopping, changing towels and bed linens, and overall just getting your home nice and clean. Although this may sound like the dreaded marathon cleaning sessions I mentioned above, it really isn’t. The difference is that nothing has become very filthy, because you just cleaned it last week, so although there is time and effort involved it is nothing like cleaning a very dirty home. Further, even this can be done with interruptions. Cleaning isn’t rocket science, and we can stop to help our children with something they need, or to take a phone call for work, or whatever else and then get back to the cleaning tasks again. The advantage of a system like this is that you don’t have to clean everyday, meaning you don’t feel like you’re cleaning all the time. The disadvantage to this method is that if you’re having trouble fitting cleaning into your busy schedule, clearing out this much time for cleaning may be difficult for you to accomplish. The other end of the spectrum is to take these weekly chores and break them up, doing just one or two of them each day. You could vacuum on Monday, mop on Tuesday, clean the bathrooms on Wednesday, etc. You get the idea. The advantage to this system is that you still get everything clean each week, but you don’t have to carve out such a huge hunk of time out of a specific day. The disadvantage is that you can start to feel like you clean all the time, since there is generally a cleaning task you should do each (or most) days. Like I said, your personality and your own unique circumstances, such as your energy level, time availability, size of your home, number of children in your home, etc., will determine which exact strategy is right for you. However, with either method, or a hybrid you employ, your home will be basically clean most of the time and never get too dirty. That is why creating a weekly cleaning schedule is such a powerful and helpful habit for your home. 4. Develop a similar schedule for even less infrequent cleaning tasks. Like I said, there are also cleaning tasks in your home that need to be done even less frequently than weekly. The biggest ones people generally think of are spring and fall cleaning tasks. Just as with weekly tasks, you need to decide whether you want to do them in big chunks, like a few days in the spring devoted to spring cleaning, or if you’ll incorporate them into a cleaning schedule that spreads the tasks out over the course of a year. Again, there are no right or wrong methods or schedules, just what works best for you. So What Cleaning Tasks Need To Be Done At What Frequency? In addition, you receive three blank schedules that you can fill out, one for daily cleaning, one for weekly cleaning, and one for your laundry schedule. These can be personalized for your own life, family, time and energy levels, and your home, using the checklists as a guide to make sure you remember all the big tasks that should get done. As an added bonus you’ll also receive a cleaning supply checklist that you can post in your cleaning closet, or anywhere else, to make sure you have all your cleaning supplies on hand when you need them. Since I’m making this e-book a free gift, to receive it you need to become a Fan of one of my website’s Facebook pages. You can either become a fan of Household Management 101’s Facebook page or Stain Removal 101’s Facebook page. Once you become a fan you will see the tab to get your free e-book as a special thanks to you. Taylor Flanery is the mother of three young kids, a former lawyer, and someone who has learned the hard way that cleaning up as you go, and on a regular basis, can make the difference between happiness and housekeeping insanity. 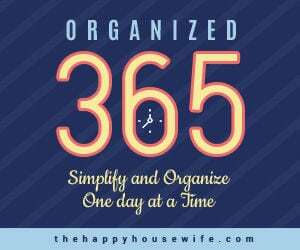 She writes at Household Management 101 where she discusses schedules, routines and habits for your home, along with other topics related to her adventures as a mom and household manager. She also writes at Stain Removal 101 where she discusses the how tos and whys of house cleaning, laundry, and stain removal for your home and clothes. Great post! I’m really looking forward to the rest of the series. A couple of weeks ago, I posted about how I have been scheduling my cleaning into my daily schedule, but I am always looking to improve how my day runs. Thanks for the post. I also stumbled your post! Thank you for starting this article. I am very intrigued, so far!! If I didn’t know any better, I’d think you’re writing about me. I’m looking forward to the rest of this series. 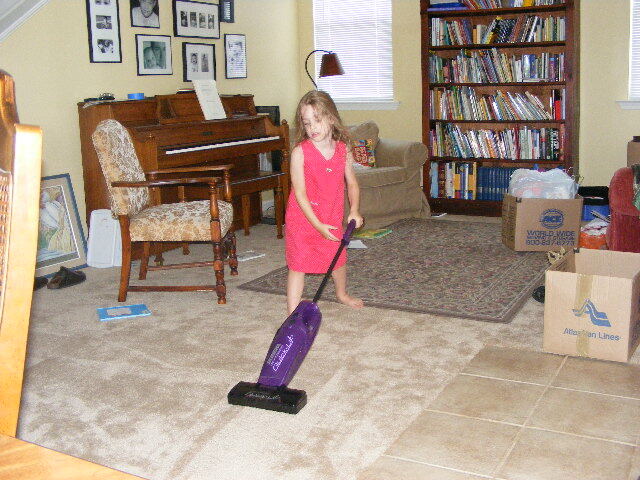 My mom always cleaned the whole house on Saturday morning, but somehow it rarely worked for me, and it drove me nuts to see the dusty furniture and linty carpets. Recently, I’ve started doing one cleaning chore each day (dusting on Monday, vacuuming on Tuesday, etc. ), and it’s WONDERFUL! I’m able to keep up with my chores and my house actually gets cleaned every week! My struggle isn’t finding the TIME to clean but the WILLPOWER. 🙂 This has been an area of tension for me and my husband since we got married almost six years ago… I need to get it through my thick skull that cleaning the house is showing him that I love and respect him! I am so looking forward to the rest of this series too. I struggle with finding the time to do it all. Homeschooling, cleaning, and etc. You all know what I mean. I am so glad I found you!! I’ve never been a fan of marathon sessions. I feel like I spend a lot of time cleaning and by the time I get done, the house is already messed up again. I prefer doing a little bit each day. I used to do a room a day. I felt like I didn’t have to spend a lot of time and my house always looked pretty good.